Knowing that a search for “high concept” can come up with some confusing information, I thought I’d share my response here in case it’s useful for you too. 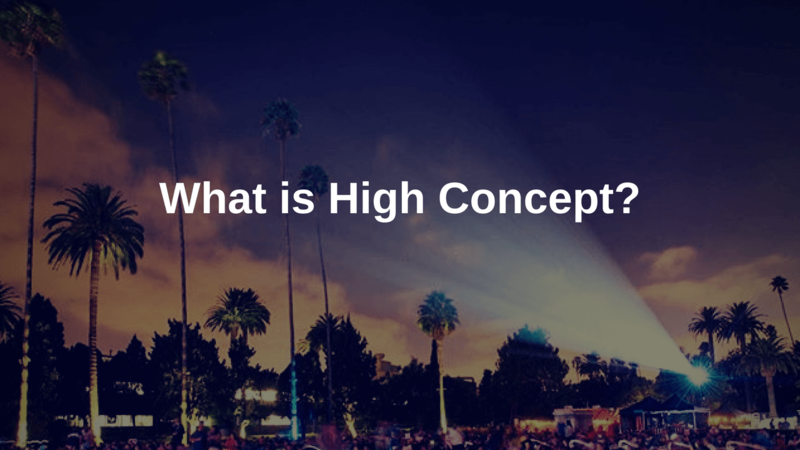 What does “high concept” mean? First, a caveat: everyone’s going to have a slightly different understanding or gauge of what a high concept idea is. Even among people in the industry. Although we throw the term “high concept” around like it’s a defined thing, really it’s a way of describing certain ideas that carries a degree of subjectivity. What high concept means is that something is easy to pitch because the entertainment hook is in the concept itself. Meaning, what’s appealing about that movie project is right there in the idea. A non-comedy example might be Safe House (a young CIA agent has to transport an experienced, traitorous CIA agent to a safe house). Or, probably even better, something like Geostorm (a global storm threatens to destroy the earth). You might not find the concept especially intriguing, but it is easy to grasp and we know the entertainment value comes from the spectacle of the Earth and all of humanity being destroyed by weather patterns. So a hallmark of “high concept” is something that’s easily pitchable. In one sentence I know what I’m getting in that movie, and I know where the entertainment value is coming from. Sometimes even just the title is enough. But just because something is easily pitchable doesn’t necessarily mean it’s all that interesting of an idea, which is another quality most people mean when they use the term “high concept.” The concept is both instantly gettable and intriguing. The mental real estate of the familiar element makes it quickly gettable, while the fresh element makes it feel new, interesting, and intriguing. Kind of like any good joke, right? Set up the expected, then subvert or surprise with the punchline. Sometimes it’s easier to understand what something is by looking at what it isn’t. If you hear something like, “I know it sounds boring but if you read it, you’ll see…” then it’s not high concept. If I have to read the script to understand the appeal of it then that’s basically the opposite of high concept. So, how do you come up with high concept ideas? You could use one of the many prompting exercises, like taking a common idea (a plane hijacking) and trying to dial up the elements to make it high concept. (What’s the most extreme version of that? The PRESIDENT’S plane is hijacked! = Air Force One). You could start by simply coming up with a bunch of ideas first, and then look for which of those are high concept. Or that could be made more high concept with a little tweaking like in the exercise above. It doesn’t have to be a painful process to generate a bunch of new screenplay ideas, either. And the best way to have good ideas – high concept or not — is to have A LOT of ideas.